Happy National Pomegranate month! 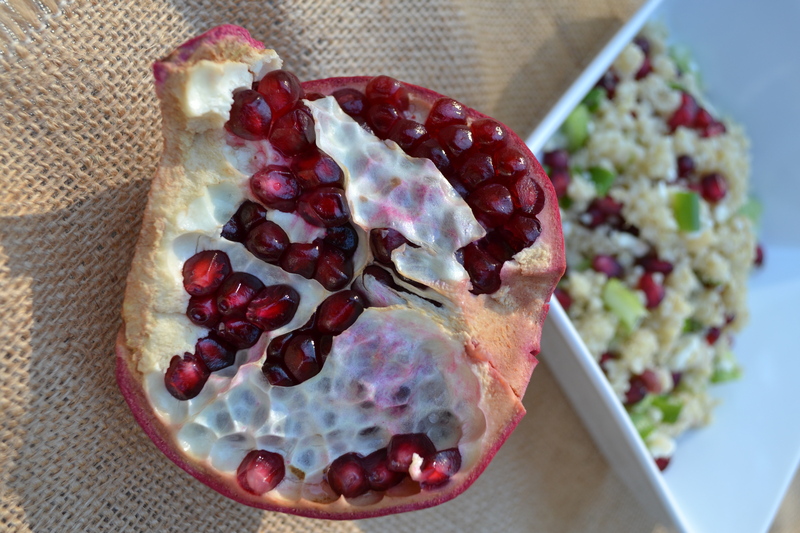 It is that time of year when you can start to find pomegranates in the grocery store, and why not take advantage? Fun fact about me: I have never actually cut open and de-seeded a pomegranate before. It was actually surprisingly easy. I used a tutorial from Simply Recipes. Basically, you cut off the bottom and the “flower” on the top, before cutting 7 shallow cuts around the pomegranate. 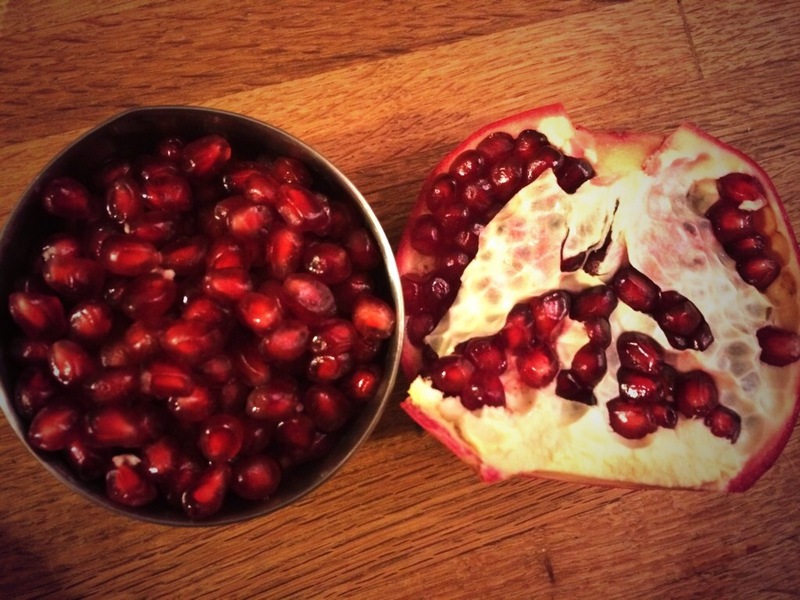 I peeled apart the pieces of pomegranate and let the seeds fall into a bowl of water. Many tell me separating the membrane from the seed can be a pain, but with this method the membrane just floated to the top! Highly recommended. I am excited to bring some festive pomegranate recipes to you this month. 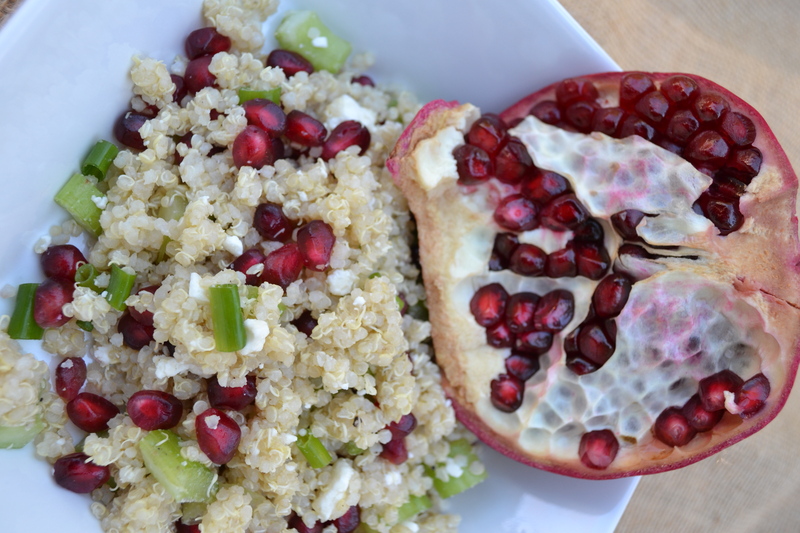 My first is an antioxidant rich pomegranate and quinoa dish. It works perfect as a side to grilled chicken or fish, or put it on top of a bed of lettuce! Quinoa is the only grain that has protein in it, so you are sure to feel full with a smaller amount. Bonus: it takes 20 minutes to make. Hello new go to quick and healthy meal! Cook the 1 cup of quinoa according to the package directions. While the quinoa is cooking, dice the celery, and chop the scallions. Once the quinoa is cooked and still warm, add the olive oil, feta cheese and pepper and mix until cheese is evenly distributed. 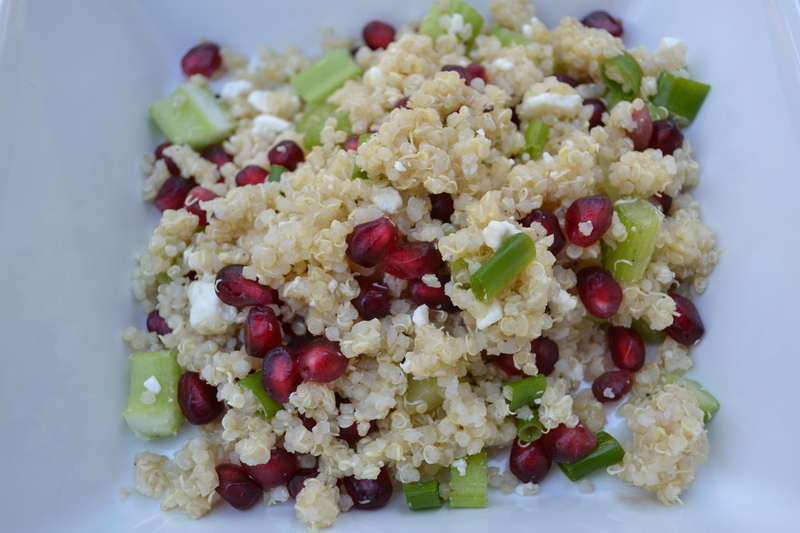 In a large bowl, combine the quinoa mix, pomegranate seeds, celery and scallions. Mix well and serve along side your favorite lean meat or on top of a bed of lettuce for a complete meal! What other kind of pomegranate recipes would you like to see here? Leave your comments below!